Alex and the kids are in Nebraska visiting relatives for the 4th of July. The house has never been quieter! Caitlin has been on a mini-vacation going to visit Oxford, Mississippi (Faulkner is the big lure here) as well as Beale Street and Graceland. (Caitlin please come back! Planting tomatoes is not as much fun without you!) The other interns, Ed and Rachel, are about to leave for their westward journey, on to a farm that grows 30 acres of fruits and vegetables in Colorado! For July, Lori's brother is coming in and so is one of their friends from New Orleans. Caitlin and I are plotting how to get free rides on his motorcycle. Today Lori and I planted a ton a tomatoes and are currently getting ready for tomorrow's market. I felt like a dentist as I extracted a bunch of rocks. We added some amendments that are delicious to tomatoes: fish emulsion, manure, bone meal, lime, peat moss. Oh! And two farmers delivered four gigantic straw bales today! I've never seen anything like them!! Yesterday I planted a bunch of beets and some green basil and lovely Red Ruby (purple) basil. I worked late into the night preparing new seed homes for fall produce. Anticipate some lovely Red Orchid Chicory! For dinner appetizers I made lovely Afghan dumplings called Aushak. They were on a bed of garlicy yogurt and had a side ginger, coriander, beef sauce. We got the beef the day before from Doug and Claudia Kalmer, our neighbors. They have 9 cows right now.Thanks ya'll. 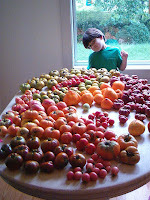 We were especially jealous because they have a ton of tomatoes and ours are not quite ripe yet. At the Memphis garden, we are getting beautiful ripe tomatoes but the squirrels are taking bites! Luckily, Doug Kalmer gave us a small, very potent vial of fox urine that should temporarily keep away those squirrels. There are a few other projects in the works. We are getting a green house soon, so we'll be doing some construction. Also, I found this book called Circle Houses. SO COOL!! So, we're going to make a yurt. Alex favors the ascetic ones; I like the the woven branch ones. Well, whoever builds it gets to choose...so I guess I get to choose! Alex and Lori are pretty gung-ho about any side projects I want to do while I'm here. The ultimate goal is a stone, outdoor shower. Of course, Alex and I disagree on the design...but again, whoever builds it decides... Anyway, there are enough big stones in the creek. I'm going to try to get Caitlin excited about it so she'll help me haul the big ones. Alex's corn is taller than Hattie and the first harvest will be sometime this week. (He's very sad to miss it because the corn crops are like children to him.) He said the trick to harvesting it is when the little corn ears fold down a little. My beans are beautiful. BEAUTIFUL! I planted them seed by seed in May and now they are ready to eat! Really pretty Merveille De Piedmonte. The swiss chard and lettuces are on their way out. Cucumbers are ready to eat! Time just speeds along this time of year. You turn around and plants have grown a couple of inches in the blink of an eye. Soon we will see our kitchen tables fill up with tomatoes. Already it is time to say "so long" to intern Harmony Hudson as she will be returning to Conway Arkansas to work the summer and start her senior year at Hendrix College. Great things will be in store for her enthusiastic and pioneering spirit, no doubt. We have been getting to know the newest intern Caitlin from Montreal and talking about summer plans. Still waiting on a couple from Chicago coming this Sunday. We shall see. But what is most striking is how much willing help and curiosity this whole farming adventure has brought our way. The Downing Hollow Urbagrarians, who my sister Sue thinks should be renamed the Sharecropper Sisterhood, have been building a wonderful garden at our house in Memphis. That garden has a 100 tomato plants, 30 plus peppers and just as many eggplant. There are rows of French heirloom bush beans and pole beans, as well as lots of cucumbers and squash. Not to forget the fingerling potatoes and a nice row of melons we are training up a trellis to conserve space. Just got to get some okra in somewhere!